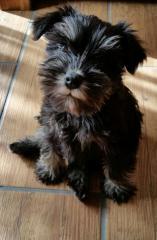 Sanrau Kennels for schnauzer puppy love! 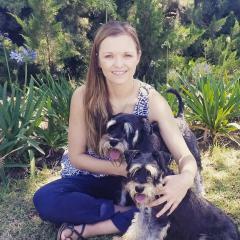 Right: Me with Zinzan and Benji, our males. Our dogs are our pride. 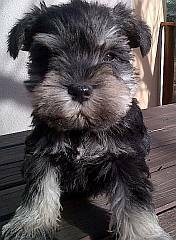 We aim to breed top quality pets with the right temperaments and qualities a miniature schnauzer pup should have. We are situated on a farm close to Somerset East, Eastern Cape. On 8 weeks I deliver the whole litter in Port Elizabeth for free. From there, my pups go by plane to their destination. Our pups fly all over the country and even to other African countries. In our breeding program we have 4 females, Jenna, Mandy, Zoe, Gretha and 2 males Zinzan and Benji. They are line bred out of some of the best available families. Week 6 to week 8 we start with basic potty training and I teach them basic ball skills. They also spend a lot of time with my 3 toddlers, so they will be able to interact nicely with your kiddies. They are also well socialized with other animals as we have lots of them here on our farm. They play in the garden on the farm all day long and are treated with all the love and attention a little pup needs. Pups are dewormed on 3 weeks. 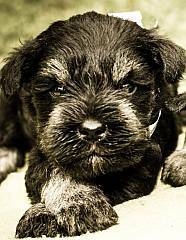 On 6 weeks they are checked by our local vet, inoculated, dewormed and micro chipped. The well-being and health of our mothers and pups are our main priority. Therefore mothers and pups are only fed with the best Vet quality products. PLEASE EMAIL ME FOR PHOTOS. “Riley is the light of our lives! I have never met a dog with a more fantastic temperament than this little dog. We completely and absolutely adore her. She is like our little floppy doll. She loves love! And is just the most gentle animal in the world! I can’t imagine life without our Riley. You chose so well! I wonder how on earth you knew that this dog would turn out sooo special. Because she really is. So thank you, thank you! “I have to compliment you. 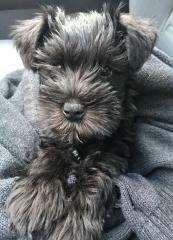 Merlot is one of the most intelligent puppies I have ever met. She is basically potty trained. She is the most gorgeous bundle of love and joy in the world. I enjoy her SO much. Thank you!" 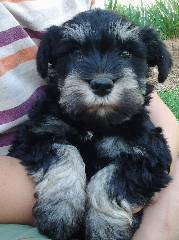 Miniature schnauzer puppies bred by us. The name, "Sanrau," is a registered KUSA affix. 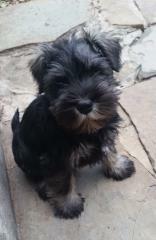 Our puppies will be KUSA registered (with breeding restrictions unless otherwise arranged). A microchip is implanted in every puppy before it leaves our care. The buyer will get a KUSA registration certificate.